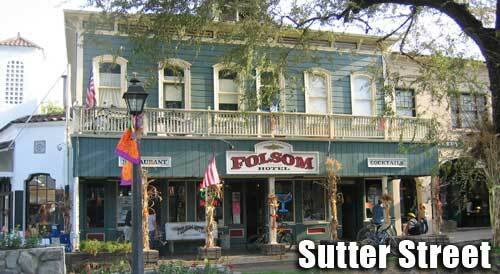 Folsom�s historic heart is Sutter Street � the city�s original business district. It is the home of the Folsom History Museum. Gold rush stage coaches dropped off miners looking to become rich in the foothills river beds. The Pony Express stopped in Folsom to drop off mail. The Sacramento Valley Railroad � the first in California � linked Sacramento to Folsom which soon became a busy economic center for the foothills. The street hosts yearly street fairs and other events so visitors can enjoy the quaint and historic setting of the area. Unique shops including antique, collectibles, art and more. Historic Folsom is also features many fine dining choices. The area is the first stop for many visitors and residents.